Eggs cooked in a skillet. That’s exactly what a frittata is, and sometimes it is the reason you get up in the morning, other than the essential mug of coffee, or steaming tea. Either way, you need to eat something substantial to get your body moving upon waking, and eggs are a good way to go about that. And one can never really get tired of a frittata, as it is an excellent way to use up whatever leftover veggies you have in the pantry or fridge. 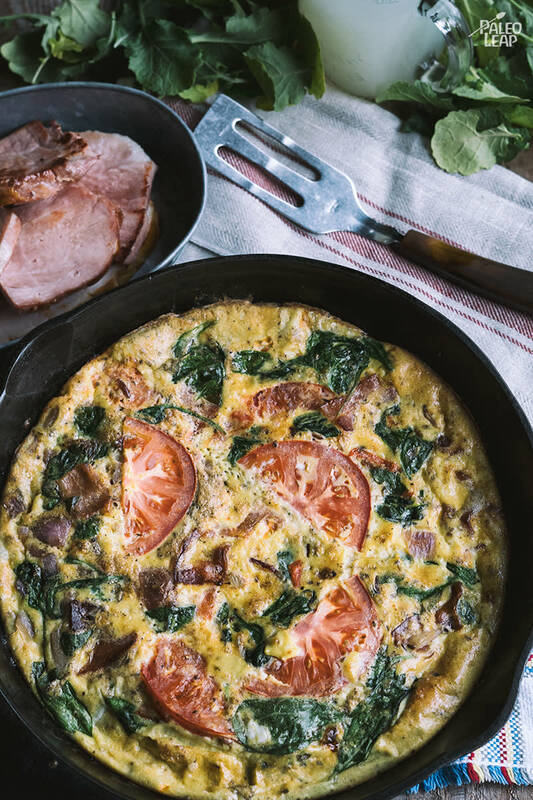 Any which way you slice your frittata, it really is a great way to start the day, whether you are waking up alone or preparing breakfast for a crowd of ten hungry friends or family members. In a bowl whisk the eggs, and season to taste. Melt the ghee in a oven-safe skillet over medium heat. Add the garlic and onion, and cook until soft, 2 to 3 minutes. Add half of the sliced tomatoes, all of the crumbled bacon and spinach; cook another 2 to 3 minutes, or until tomato is soft. Pour the eggs into the skillet. Cook until it starts to set just a little, then place the remaining tomatoes on top. Transfer the skillet to the oven and bake for 15 to 20 minutes, or until the frittata is fully set.